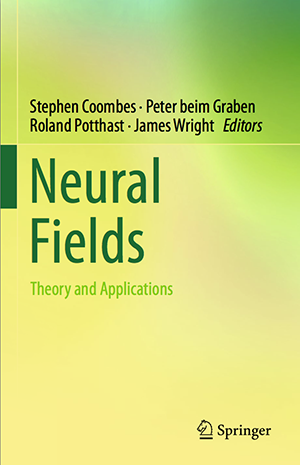 Editors: Coombes, S., beim Graben, P., Potthast, R., Wright, J.
Neural field theory and its applications have a long-standing tradition in the mathematical and computational neurosciences. Beginning almost 50 years ago with seminal work by Griffiths and culminating in the 1970ties with the models of Wilson and Cowan, Nunez and Amari, this important research area experienced a renaissance during the 1990ties by the groups of Ermentrout, Bressloff, Haken, and Wright. Since then, much progress has been made in both, the development of mathematical and numerical techniques, and in physiological refinement and understanding. In contrast to large-scale neural network models described by huge connectivity matrices that are computationally expensive in numerical simulations, neural field models described by connectivity kernels allow for analytical treatment by means of functional analysis methods. Thus, a number of rigorous results on the existence of bump and wave solutions or on inverse kernel construction problems are nowadays available. Moreover, neural fields provide an important interface for the coupling of continuous neural activity to experimentally observable data, such as the electroencephalogram (EEG) or functional magnetic resonance imaging (fMRI). And finally, neural fields over rather abstract feature spaces, also called dynamic neural fields, found successful applications in the cognitive sciences and in robotics.